Former Minister Alan Kelly’s ‘Rapid’ build homes initiative is anything but fast. Initially 500 homes were planned for completion by the end of 2015, the pilot scheme due by Christmas 2015. In the end just 22 homes were delivered in Poppintree, Ballymun by May this year, 6 months later than planned. This delay was anticipated by construction experts at the time, due to an unrealistic Ministerial timescale at the outset (see post here). The Poppintree homes do not meet Dublin City Councils’ own minimum standards (see Dublin Inquirer here). Despite widespread criticism Minister Simon Coveney is persisting with this policy and intends to roll out hundreds of these homes at an average construction cost, excluding site costs and fees, of almost €250k each (see project budgets here). The overall costs of these homes are almost twice the price of permanent homes in the same location, available to buy immediately. “Undoubtedly, the greatest victims of the housing crisis in the midst of which we find ourselves are the homeless and those in emergency accommodation. There are massive records being set on a regular basis in peaks of homelessness, such as the 2,426 children in emergency accommodation. It is deeply frustrating and worrying for ourselves. We do not want to be seen to be angry about this, frustrated or ramming these figures down the Government’s throat, but there was a provision made by the previous Government this time last year to provide 500 rapid-build units to address the immediacy and the urgency of the situation. Only 22 have been delivered. Can the Minister inform the House as to the logjams, problems and difficulties that have arisen by virtue of the fact that the Government has not been able to meet its predictions in that regard? If we learn of these problems and are made aware of them, perhaps we, as legislators, can help and assist in order to rectify them and ensure that they can be delivered more speedily in order that people can extricate themselves from the terrible predicaments in which they currently find themselves. I am pleased that these questions have been asked. Often, the debate around rapid build becomes very negative because the initial rapid-build project – which was something of a pilot project – was delayed and encountered problems. The easy thing would be for me to say that I am not going to answer for my predecessor and all the rest of it. However, the reality is that what the previous Minister, Deputy Kelly, did constituted a genuine attempt to try to bring a new technology into building social housing a lot faster. A whole series of things happened that slowed the process down. That probably frustrated Deputy Kelly more than anybody else. This is actually a really positive story and I want to go through what we are doing now. My Department is working closely with the four Dublin local authorities in relation to the rapid delivery programme. A total of 22 rapid-build units have already been delivered and are occupied. A total of 350 rapid-build houses will be advancing through various stages of delivery, including construction, by the end of this year. A further 650 rapid-build homes will be advanced in 2017, with another 500 units to be delivered in 2018. It should be noted that Dublin City Council is currently advancing a number of rapid-build projects, including four in Finglas, Darndale, Cherry Orchard and Drimnagh, which will deliver a further 131 homes. These homes will be handed over to Dublin City Council on a phased basis from the end of the year and delivery will be completed early in 2017. My Department is working closely with the council to expedite delivery. In addition to these four projects, further work is under way across the four local authorities that will bring to 350 the total number of rapid-build homes advancing through various stages of delivery, including construction, by the end of the year. The additional sites in question are in Dublin city, Dún Laoghaire, Cherry Orchard, Tallaght, Blanchardstown and Balbriggan. Construction dates will be finalised in the context of completion of procurement and award of contracts. Sites are being identified and planning requirements advanced for a further 650 rapid-build homes in 2017 across the four Dublin local authority areas and also in Louth, Wicklow, Kildare, Meath, Cork, Waterford, Galway and Limerick. This will ensure that the commitment in Rebuilding Ireland to deliver 1,000 rapid-build homes in 2016 and 2017 is met. The standard delivery timeframe for a traditional social housing construction project from inception to occupation can range from 12 months to three years, depending on the complexities of the project. All social housing construction projects, including rapid-build projects, must follow certain basic steps before construction can commence. There has been significant pressure to ramp up delivery, which local authorities have been responding to positively. However, there are requirements, such as in the context of procurement, that have to be adhered to and that, in some instances, have caused delays. Notwithstanding this, I am confident that all parties are endeavouring to move the programme forward speedily. We now have finality from the Government office of procurement to put a central procurement list together that local authorities from anywhere in the country can simply pick companies from, because those companies have been through the procurement tests, certification and so on. I know that this has got off to a bad start in some ways. I have regularly had debates on that in media and elsewhere. However, I actually think a lot of private estates are going to be built with this technology as well. Rapid build is simply a different way of constructing houses. Much of the assembly is done off-site in a factory-style setting where pieces are craned in and put together, which allows one to build houses faster and potentially create economies of scale. I do not doubt the Minister’s good intentions, goodwill, willingness and effort to address this issue, nor do I doubt the frustrations of the previous Minister, Deputy Alan Kelly, to which the Minister referred. In fact, that is very much self-evident on a regular basis. The Minister committed in the Rebuilding Ireland document and again here today to a further 900 to 1,000 units between the end of this year and early next year. That is fine. I wish the Minister every success and I hope those targets are achieved. However, I wish the House to be aware of the difficulties that were experienced by the Department, the providers and those whose responsibility it was to have 500 units in place within a year from the date of the announcement last year. If the Minister failed to reach that target, why was that the case? I just wish to ensure that the same mistakes are not made again in spite of the efforts on the part of the Minister, the Department and the local authorities. I acknowledge and welcome the extensive roll-out across other counties apart from Dublin because the housing lists, crisis and problems are evident throughout the country and not only in the main centres of population. Could the House be made aware of the difficulties that were experienced in order for us to be sure that the logjams have been cleared? The only case therefore for rapid build is if the houses can be delivered much quicker and if it is cheaper. The evidence in Dún Laoghaire is as follows, and I will listen if the Minister can tell me different. Dún Laoghaire-Rathdown County Council is building ten council houses in Sallynoggin and we are told the project will take 12 months. It is also building 12 rapid-build houses on another site, when we wanted bricks and mortar, and it is said that the project will take 12 months, but the work can start straight away in Sallynoggin because there are no procurement issues while in George’s Place, where the rapid build project is located, there has been a delay since September because of the procurement issues. Even when the work starts, it will take the same amount of time as traditional build, so why would one not do traditional build? In addition, could the Minister clarify the issue of cost because it seems there is no significant difference in cost either? As the Minister knows, Sinn Féin has supported the rapid-build projects where they have been undertaken so far and we are not looking to undermine this particular part of the strategy, but I share the concerns on a number of issues of both of the Deputies who have spoken on this side of the House. The use of language here is very important. The Minister talked about 350 additional units advancing before the end of this year. What we want to know is how many of those will be under construction by the end of this year and when will the units be finished? Likewise, for the 650 houses to advance next year, when will they be under construction and when will they be finished? What we want to know is when people will be moving into those houses. That is the first thing. I share Deputy Boyd Barrett’s concern about costs because, unfortunately, different levels of cost are being reported in the media and we do not know whether they are true. The Minister responded earlier in reply to Deputy Boyd Barrett and referred to 33,000 units owned or managed by local authorities. He included rapid-build houses in those figures. Rapid-build houses were originally meant to be emergency accommodation. I just want to know, of the numbers in the plan, how many the Minister intends to count as permanent social housing because that is a change from the plan of the previous Minister, Deputy Alan Kelly, and I wish to get clarity. I previously asked the Minister whether any of the rapid-build projects would include timber-framed homes because they were built mostly in the private sector and it seems to me that quite a few of them have had issues that came to light in various counties. We did have rapid-build housing previously in parts of the city, for example, south Finglas, and we had to go back and rebuild the houses. A lot of money was spent redesigning the houses and on other elements. The Minister mentioned a number of sites in my constituency of Dublin Bay North. For years we asked the Government of which the Minister was a part, and the Government of which Deputy Cowen’s party was a constituent part, for funding to build ordinary bricks and mortar houses on those sites but they would not give us the money. That is the reality. The production of homes by the Government since 2011 is an appalling statistic. First, we should have been building many more social houses than we were able to in recent years but people conveniently forget the storm Ireland has come through. We were borrowing money with a lot of conditions attached, which made it virtually impossible to be able to fund the kind of social housing building programme that was needed during those years. We now have an economy that is recovering and we can afford to spend a lot more money. We are ramping up dramatically to deliver social housing through a social housing building programme as well as an acquisitions programme, getting vacant properties back into use and all the rest of it. One can build houses through conventional building methods and there can be a need to go back to repair them if they are badly built. Standards are the issue here. The technology must deliver standards, whether that is pre-assembly in a factory setting or by traditional-build methods, and technology is moving on. As my colleague, the Minister of State, Deputy English, said, there are steel-framed houses built with this technology in Dunshaughlin that are on sale today for more than €400,000. That is how houses are being built. …It is a case of using the best available technology to get houses built as quickly as we can to try to meet the demand for social housing. It is as simple as that. If one looks at the reasons that the rapid-build programme has stalled and is taking longer than some had hoped, one can point to procurement, for example. It has taken the Office of Government Procurement some time to get the framework in place. We had hoped that would be done by the middle of summer 2016 but it is only being done now. There are reasons for that. Let us face it; there have also been protests. There was a lot of local resistance to a number of sites because of the kind of fears we have heard today, namely, that the houses would blow over in the next storm. That is not the case, but they were the fears expressed. There have also been some planning issues in terms of trying to progress the programme because of the suspicion around rapid build and whether it could offer the kind of quality we need, among other issues. We have moved on from much of that now. From a procurement point of view, we have clarity and speed, and from a Part 8 point of view, all of the 350 or so houses that will be at various stages of progress by the end of the year will have achieved planning permission and will have funding signed off and the work will be progressing. I do not think that this is any more expensive than building so-called conventional houses. When one looks at the price in Poppintree, for example, when the final costs came in, it was not as high as many had predicted. There was a robust negotiation with the developer on that. There was a very pointed question about what the houses would be used for, which is a very fair question. When we ramped up the numbers to go from 500 to 1,500, clearly this was about social housing provision as well as emergency accommodation. My preference is that homeless people should be a priority in this context but when we are talking about the numbers I suspect we will deliver in the coming years from rapid build and of the tens of thousands of social houses we may build in the future, we may find that this technology becomes the norm, both in the private sector and in social housing build programmes. It would be wrong to say that all of these units will be for temporary emergency accommodation. That is unlikely in reality. There is nothing wrong with timber-frame accommodation if it is constructed in the right way. In a climate like ours, the inner leaf can be timber frame but the outer one should be solid. Houses have to be built to a certain standard and to ensure that is done, we must have a proper inspection scheme. The Minister should reconsider getting the local authorities involved in inspecting the way things are done. It will make a huge difference and save the Government money in the long term. I have built timber-frame houses which I guarantee are of the highest quality, but always with a solid leaf on the outside. With regard to the time it would take, timber frame inside and conventional outside would be quicker than what is called total conventional. I totally agree with what has just been said. It has taken some time to put a procurement framework in place. Companies are tendering to build these kind of houses and they will be building them years to come. I suspect this is not just about the 1,500 we are planning. I believe it will go well beyond that, but that is what we are committing to for the moment. I have been in and out of building sites all my life. 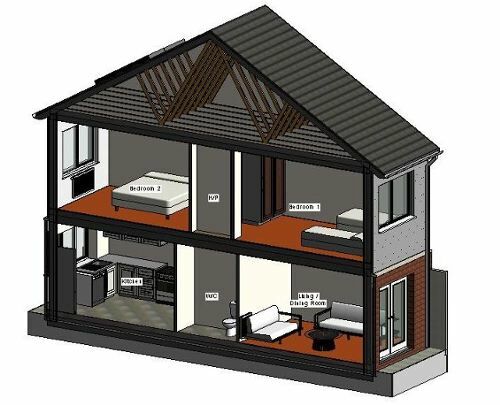 The timber-frame technology is the norm in many countries and when it came into Ireland—–The issue here relates to standards, quality, certification and consistency, and the need for a high-quality procurement process that ensures we get we will get all of the latter from reputable builders. Is ‘Rapid’ housing too little, too late (again)? Modular Housing: ‘Rapid’ solutions or expensive technical problems? PREFAB PROBLEMS | Is Minister Kelly hoping for a white Christmas? This entry was posted in Building Regulations on November 22, 2016 by BRegs Admin. It’s hardly surprising we’re in the current mess. In 2007/8/9 we suffered a BANKING crisis – not a building crisis. The crash was caused by the reckless lending by financial institutions and their lies and deceit about the disaster they had caused until it was too late. Then they came begging to be bailed out because they were “too big too fail”. The banks were bailed out, with our taxes, but rather than lay the blame on the culprit bankers the entire political establishment and the media turned their ire on the developers and builders. The construction industry, rather than the banking establishment was thrown to the wolves. Thousands left the industry (and the country) as a result and building work ground to a virtual halt. It didn’t take a genius to predict in 2009 that there was going to be a housing crisis in a couple of years. Not that the construction industry is blameless. Yes there was greed and stupidity. And worst of all there was disastrously poor building design and construction unchecked through a crazy policy of self-certification of the Building Regulations. Also having shifted the production of social and affordable housing on to private developers through Part V of the Planning Act the death of the construction industry naturally was going to halt the construction of social housing while the need for social housing never stopped increasing, financial crisis or no financial crisis! So the banks were bailed out and self-certification “sorted out” by creating a paper trail to a scapegoat. Then when the housing shortage became a “crisis” affecting the safety of politicians dail seats our politicians seem to be chasing their tails and scratching their heads wondering why builders aren’t piling in to build thousands of homes, private and social! It’s their own fault though! Currently the developers and builders, in their wisdom, look at the risk and financial return, see a “hot” commercial market and pile into building offices – easy to build, big empty floor open plan buildings to be fitted out by tenants. Far less risk, far less hassle, far greater returns and a rent roll at the end. And who can blame them – they’re not charitable institutions, they’re commercial concerns. The term “reap what we sow” comes to mind.